In my perfect world it’s always 9:30 Sunday morning, about 65 degrees and a little sunny. I am finishing washing my big, dark Mercedes, while listening to Bach’s “Matthew Passion” on CBC2’s Choral Concert. My two grandchildren, Violet and Drake, are sitting on my lush lawn quietly playing chess. Grandpa is going to take themsailing today. At the end of my long, but not too long, private dock is my immaculate Friendship 36 daysailer, the perfect Grandpa boat. Next to it sits a bright red C&C 30 One Design. But that’s Grandma’s boat and a bit much for Grandpa these days. But it’s really 8:13 a.m. on a Thursday and it’s raining hard. The lawn is lush all right but I don’t have a big Mercedes anymore, and I don’t have a private dock. What I do have is this very nice design from Ted Fontaine to review. Besides, I like the rain and I like wearing flannel shirts in July. I always enjoy reviewing Ted’s work. His drafting, if we can still call it that, is exquisite and full of tasty details. Ted has a well honed eye for pretty proportions and has this style of boat down to a fine art. You can easily see the lineage going back to some of Ted’s large cruising designs. This is a hull form that Ted is very familiar with. At a time when so many designers are trying to make boats as light as possible Ted goes the other way and exploits the benefits of displacement. The D/L of the design is 407. That is very high. But displacement gives you stability. Remember that righting moment is righting arm times displacement. One downside to displacement is that weight means more materials, so a heavy boat can be very expensive. Ted’s client for this design lives where he is draft restricted and the new boat has to live comfortably at the owner’s dock. 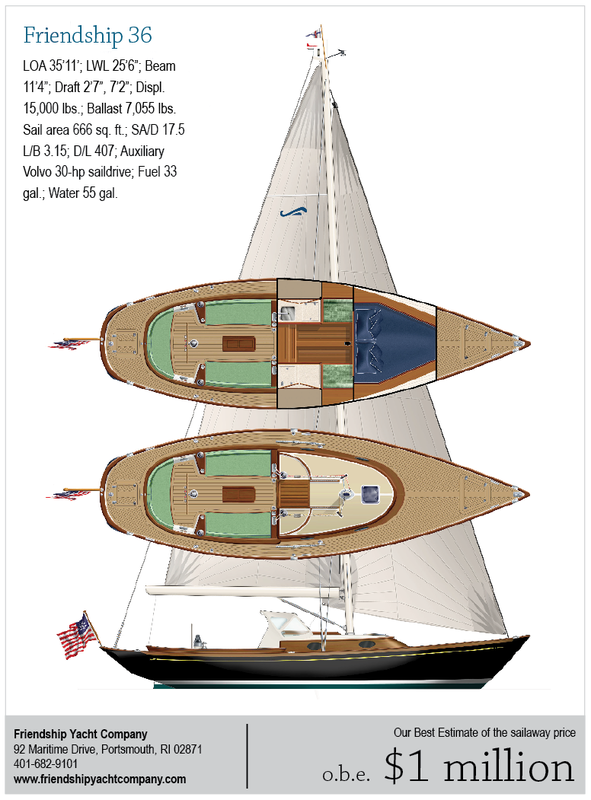 The new 36 draws 32 inches with the board up and 7 feet 2 inches with the centerboard down. The L/B is 3.15. The client’s previous boat was a Friendship 40 so overhangs give him the look he is after and he gets about 10 feet 6 inches of total overhang in this design. Twin rudders will provide good control despite their short span. The accommodations are very simple in keeping with the daysailer type. There is a head to starboard under the seat but it is not in it’s own compartment. There is a mini galley to port with a sink. There is a large double V-berth for napping. The centerboard trunk does protrude slightly through the cabin sole. Headroom looks just shy of 6 feet, but I think that looks are more important than headroom in a design like this. There is spacious seating in the deep cockpit. With bench seats forward and an arc-shaped helm seat aft. Winch islands separate the two seating areas. Mainsheet is push button with controls for both the hydraulic mainsheet and the bow thruster located at the foot of the helmsman. There are line bins located just aft of the cabin trunk to help keep the cockpit free of clutter. The cockpit table houses instruments and hinges up with a section of the cockpit sole to give access to the engine. There is a hinged anchor roller arrangement forward that prevents the anchor and roller from protruding from the stem and mucking up the lines of the bow. You see this feature on a lot of mega yachts but this is the first time I have seen it on a 36-footer. But this is no ordinary 36-footer. The 36 was built as a one-off by Rockport Marine with a cold-molded hull and deck. This qualifies the 36 for inclusion in the Spirit of Tradition regattas that are growing in popularity. The rig is all carbon fiber with in-boom furling. Standing rigging is all carbon fiber. The 36 is now sailing and Ted has a happy client.